1. 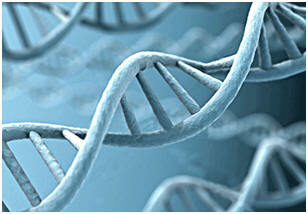 Is genetic testing for you? 2. Obstructive sleep apnea review and update—does CPAP reduce the risk of cardiovascular disease? New updates on options to treat! We are all so thankful that Harvey and Irma have left us, but there are millions of Americans suffering from loss of one or more kinds. Many of us felt the power of prayer was the answer for the lessening of the Florida hurricane that could have devastated the entire state. We all know how much more severe it could have been. Prayers for all who are suffering and their families, to the first responders, our supportive state and federal governments who were there from the beginning and will continue to help residents. There is no country that can reach out like the USA. I hope you donated to the cause. Uniting and focusing on helping each other is what our country is all about. Comment on whole genome testing!! I feel compelled to report on a recent article in the NEJM-Journal Watch (New England Journal of Medicine) regarding the value of primary care physicians getting involved with genome testing for the average low risk patient without a significant family history of a disease. The NEJM states-“unless a person has a strong family history of a disease or disorder, there is little value in opening up the issue of certain genetic tendencies in a person”. Doing genetic testing is serious business, and when someone gets genetic information and it opens up a serious concern for that family creating potential anxiety. Primary care physicians are not trained to discuss this information with their patients. In fact, there are few physicians outside of those who specialize in genetic disease that can give a person the proper information they need to proceed with an intensive investigation. The cost for an individual to get whole genome testing is about $1000. There are websites that will give you genetic information without any explanation or guidance, so be careful where you get your information. Genetic counselors are scarce (only in major university medical centers), and they are the only specialized professionals that can guide a person or family through the maze of investigating a particular positive genetic test. Most of these genetic counselors are inundated with pediatric genetic patients and their families, and there is an extreme shortage. If, however, there is a disease or disorder that runs in a family, it is suggested that genomic evaluation be considered. I have written extensively on this disorder including how apnea causes serious physiological events. 25 million Americans have obstructive sleep apnea and that is based on 1990s statistics. 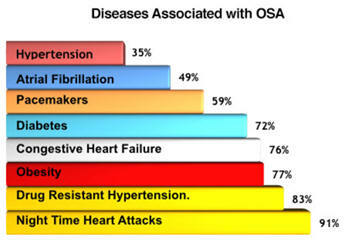 It is estimated that 26% of Americans between the ages of 30 and 70 have OSA. With the obesity epidemic occurring in this country, it has escalated the number of sufferers in adults and now in children and adolescents (20% are overweight). As high as 85% of patients do not know they have OSA. Even with that statistic climbing, the USPSTF (US Preventive Services Task Force) does not recommend routine screening for sleep apnea in the normal population. The question is what is becoming “normal” in this country? However, if overweight and a snorer, a sleep study should be discussed with the doctor. 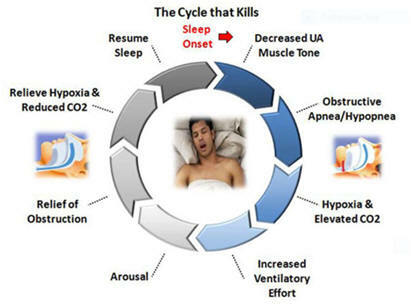 OSA is by far the most common type of apnea (the majority), and is defined as cessation of breathing for 10 seconds or longer in the face of a respiratory effort to take a breath. Hypopnea is partial airway obstruction lasting longer than 10 seconds with a drop of oxygenation by 4%. There is usally at least a 30% decrease in measured excursion of the chest when the airway is obstructed. Airway obstruction (complete or partial) causes a decrease in oxygenation and can lead to serious consequences including daytime drowsiness, serious cardiovascular effects including hypertension, irregular heartbeats, heart attacks, heart failure, and stroke. Depression is not uncommon and being chronically sleep deprived will certainly change your mood. Car accidents are often associated with OSA. With a patient sleeping on their back, especially during dream sleep, the tongue and soft palate can fall on the back of their throat obstructing the oral airway. Note the difference in a normal patient and one with OSA in the images below. If the nasal airway is stuffy or obstructed, it adds to the obstruction, but nasal airways opened or closed cannot prevent obstruction of the airway. The images clearly demonstrate this obstruction. Please follow this cycle of an obstructive event. This is what happens when a person stops breathing every time, which commonly occurs 30 or more times a hour. With OSA, there is compromise somewhere in the upper airway usually from a large tongue, large tonsils, large neck circumference, elongated soft palate, a short lower jaw, or a high arched palate. Oral and pharyngeal obstruction can be aggravated by nasal obstruction (deviated nasal septum, allergic swelling, etc.) creating mouth breathing, snoring, and ultimately worsening of apneic episodes. OSA can cause bruxism (grinding the teeth) resulting in dental fractures, and failures of dental implants. The drawing below illustrates the various degrees of oral impairment in patients. Note the relationship of the volume of the tongue to the capacity of the oral cavity. Snoring really indicates partial upper airway obstruction and should be a signal that there is some type of interference in the smooth flow of air through the nose and mouth into the lungs. In contrast, if there is lower airway obstruction (in the chest), there is noisy breathing including stridor or wheezing, and struggling that is not relieved with waking up. The index of suspicion for OSA needs to be high in anyone that snores, has daytime drowsiness, diabetes, hypertension, heart disease, sleep disorders, daytime drowsiness, and is overweight. Other signs might include waking up tired, mood swings, noticing excessive daytime fatigue, morning headaches, cognitive difficulties, or sexual dysfunction from sleep deprivation (Viagra has been reported to aggravate OSA). Women are twice as likely to not report snoring or apnea out of embarrassment. There are at-home sleep apnea testers (above photos) that are far from the quality of a certified laboratory that evaluates patients for sleep apnea. It would serve as a screening test only, but if a patient refuses an all-night study in a certified sleep lab, or has no insurance, this might be an alternative. Neurologists, Pulmonary specialists, and Ear, Nose, and Throat Surgeons play a key role in the evaluation and treatment of these patients. They consult with certified sleep centers to maintain the highest quality of study. The sleep study must be read by a certified sleep specialist to determine the presence, extent, and nature of the OSA. A complete study is usually performed over 2 nights. The first night tests for the extent and severity of OSA, and the second night to calibrate a CPAP apparatus to find the pressure necessary to relieve the obstruction. A sleep study includes an EEG (brain wave test), EKG to pick up cardiac abnormalities, an electro-oculogram (determines REM-rapid eye movement-dream stage to correlate usually with the worst time of the night for OSA), a monitor for oxygen levels in the blood(below 90% is considered harmful), blood pressure monitoring, electromyogram (to detect restless leg syndrome), snoring sensors, airflow monitoring during respiration (sensor around chest wall), and a technician who observes the patient while monitoring all the electronic studies. It is very important to validate all the physiological events altered by apnea. Discovering cardiac arrhythmias(irregular heartbeat) or cardiac ischemia(impending potential heart attack), how low the oxygen levels drop during an episode, seizure activity and interference with sleep stages, number of and length(#of seconds) of apneic episodes, blood pressure elevation during an episode, and other events are necessary to assess the full impact of apnea. The death rate from this disease is difficult to calculate since people that die in their sleep carry the answers to the grave. My grandfather died of a stroke in his sleep but was very obese and had severe snoring and apnea back before the syndrome was even really known. How many night time heart attacks occur during an apneic episode? Since I last reported on this subject, there are more appliances and devices on the market. 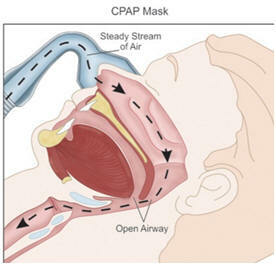 No question, CPAP (continuous positive airway pressure) is the gold standard for treating OSA, but there are many improvements you should know about. For those disappointed their results with CPAP, please carefully read this report. If you know someone who has OSA or is suspected of it, this information could save their life(and get couples back in the same bed). Weight loss is very effective in relieving some patient’s OSA. Do not forget this. 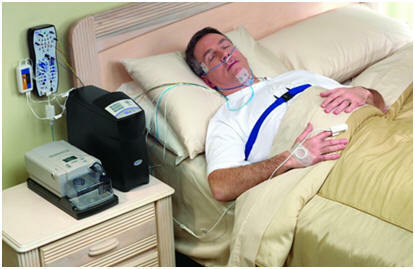 It will help lower the pressure necessary for CPAP to work effectively. A very high pressure is difficult to tolerate. Management of all medical conditions is a must including maintenance of diabetes, cardiovascular disease, etc. The patient must not drink alcohol or take sedating medication in the evening, as this will aggravate OSA. This might include some antihistamines, tranquilizers, and other medications that have sedation as a side effect. Alcohol is one of the worst not to mention opiates, which diminish respirations and lead to accidental death. Researching these options is recommended. Many try to find an alternative to CPAP without giving it a real chance. Clearly, it is the best way to relieve airway obstruction especially those with a thick short neck, a large tongue, and elongated palate/large tonsils. If a person has dental/facial abnormalities (i.e. short lower or upper jaw, high arched palate), a dental appliance to bring the lower jaw forward a few millimeters, may be very effective with snoring but rarely is adequate to relieve OSA. Going to a dental specialist that custom makes these is critical. Here are two options (above) of dental prostheses that pull the lower jaw forward which assists in pulling the base of the tongue off the back of the throat. These prostheses cost $300-2500. Some of these are adjustable over time and may be a better option as a person gets used to the appliance. Some could be incorporated into the use of a CPAP machine, and may be necessary for CPAP to really be effective. There are TV ads trying to sell “one size fits all” dental prostheses to treat snoring, but helping snoring is serious business and needs customized care, and it still may not help apnea. 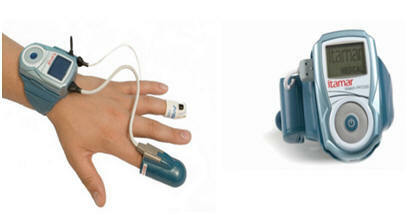 A sleep study needs to differentiate between snoring and apnea. 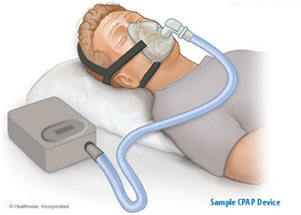 Oral appliances may help mild to moderate OSA in selected cases, but is no substitute for CPAP. Any oral appliance must be studied in a sleep lab to prove it is effective. About 50% are helped. Many patients have failed to tolerate CPAP and given up. Perhaps the addition of an oral appliance might be considered with modifications for using both. 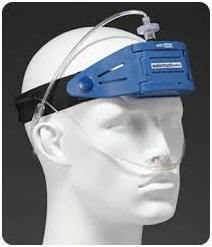 Below is a typical full face CPAP mask with the bedside monitor power box. It is critical to try different masks to see which are the most beneficial and yet tolerable. Some of the newer models are much more quiet. Humidifiers attached to the CPAP machines are strongly encouraged to keep the airway moist. important to notify the patient they have inadvertently removed their mask. The usual pressure necessary to relieve apnea episodes is 5-20 cm of water pressure. Tolerance correlates with the amount of pressure. 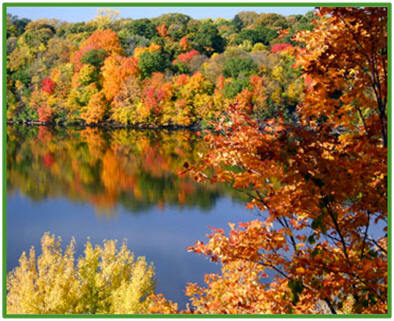 It is imperative to raise the blood oxygen levels above 90% to be considered successful. There are now other options that use continuous flow of pressure. 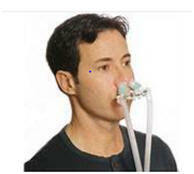 It is called BiPAP, which provides 2 pressures, one for inspiration, and one for expiration. This tends to be more tolerable. Another option is Auto-PAP, which adjust the pressure while asleep using the least necessary pressure. Most insurance requires that the apparatus have a memory card for the number of days and amount of hours per night, it is being used. Many industries (like the truck industries) require a report be submitted to the company for safety reasons to retain a driver’s license. OSA and truck accidents (and car) are a big problem with drivers falling asleep. 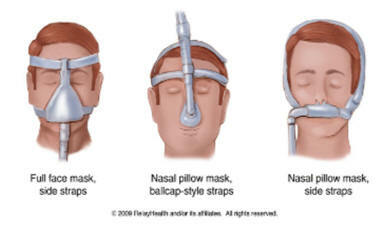 The no-mask apparatus has nasal cannulas that force air into the nostrils to relieve mild obstruction or snoring, but would be a poor option with most with moderate or severe apnea. Regardless of choice, the benefit must be verified in a sleep lab to prove its value in relieving deoxygenation and apnea. If it only helps partially, the physiologic risks continue. 1) Attend group classes at a sleep center to find out ways to improve tolerance. 2) Reinforcement and understanding by the family (and doctors) to encourage compliance by the patient and emphasize how critical it is to relieve OSA 3) Staying in touch with the respiratory center where the CPAP was purchased to have questions and concerns answered 4) Use alternative masks if not satisfied 5) Use a cool mist humidifier attached to the CPAP machine to relieve dryness in the airway 6) Prompt attention to nasal congestion, sinus issues, etc. 7) Losing weight is critical, so a weight management plan must be started 8)Monitors for use and memory cards in the machine 9)Don’t give up. Medicaid and Medicare will pay for 12 weeks of CPAP initially, and if there is improvement determined by the lab, further coverage will occur with periodic reports of use from the memory cards now installed in the machines must be submitted for certification of proper use. The larger mask will be necessary for those with a higher CPAP pressure necessary to relieve the obstruction of the airway. The mask must fit snuggly to prevent air escape. There is a new cleaning apparatus for CPAP masks that could be valuable. TrySoClean.com is the website. Having had great success with surgical management of OSA while in practice, I encourage a consultation with an experienced surgeon just to get information. I always encouraged patients to try CPAP and/or an oral appliance before considering surgery(and lose weight). Careful selection is critical to expect good results. a) UVPP--The gold standard of surgery involves removing selected portions of the soft palate, removing the tonsils, and removing redundant portions of the lining of the each sides of the throat if they excessive. UVPP means uvulo-pharyngo-palatoplasty. b) Removal of the tonsils and adenoids will relieve snoring and OSA in many children (having cured many kids with airway obstruction over 30 years). In my personal experience, it frequently relieved a child’s hyperactivity. Although not proven there must be an association with OSA and airway obstruction. 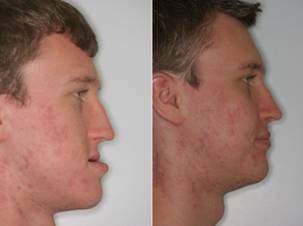 c) If facial and jaw abnormalities are present, orthognathic surgery (surgical movement of the jaws forward or backward) may be required. 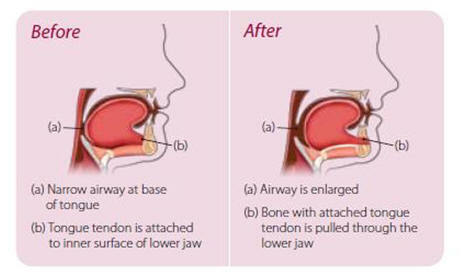 Below are examples of moving the lower jaw forward (left image) and both upper and lower jaws (right image). d) Snoring procedures--There are snoring procedures that tighten the soft palate with a radiofrequency wave ablation apparatus. Just removing the uvula will also relieve snoring in many. I performed that procedure with a YAG laser in the office very successfully. 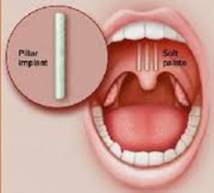 Also plastic implants can be inserted into the soft palate and may help snoring to make the soft palate more rigid, but may alter the tone of the voice as can any surgical procedure. e) Nasal surgery is often a necessary adjunctive surgical procedure(s). Mouth breathing is a clue to an issue in the nose. Frequently, allergies must be managed as well. 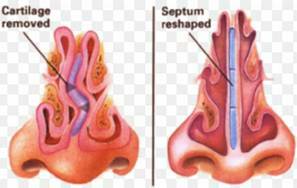 The surgical procedure involves improving the nasal airway by straightening the nasal septum and reducing the size of the turbinates (see above drawing). I discussed this previously including sinus surgery. f) Genioglossus Advancement involves removing a small portion of the lower jaw where the tongue is attached to the inside of the lower jaw, and advancing the tongue forward through an opening created in the lower jaw. This is demonstrated in the drawings below. The goal of this surgery is to move the tongue away from the back of the throat, which obstructs the airway causing OSA. g) Palatal widening procedures also allow the tongue to rest in the roof of the mouth, which assists keeping the tongue from falling back into the throat obstructing the airway during sleep. If a child is a mouth breather, they will not position the tongue correctly in the mouth thus allowing the palate to not widen correctly creating airway obstruction and a long face syndrome. In a child, before the hard palate has stopped growing, a palatal widening apparatus can actually widen the palate as it grows to relieve a high arched palate. 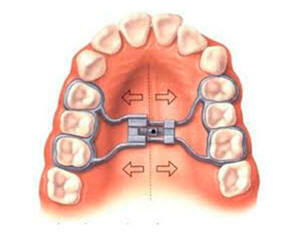 Over time, the width can be increased by the orthodontist by adjusting the hardware. In an adolescent or adult, surgery can accomplish the widening. h) Tracheostomy in morbidly obese patients may be the only option. 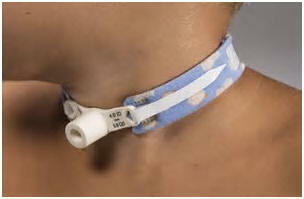 A permanent tracheostomy tube is placed in the neck. During the day, the stoma can be plugged, but at night, the plug is removed to allow free breathing by the patient. OSA is also known to increase intra-ocular pressure. There are multiple eye conditions that are associated with OSA including floppy eyelid syndrome, keratitis, keratoconus, conjunctivitis, papilledema, and optic neuropathy. It does not increase the risk of glaucoma rather if you have it or are prone to it, OSA can make it worse and more difficult to treat. If you have OSA, tell your glaucoma doctor and your OSA doctor. They may not be aware of the connection. Recent studies have analyzed whether CPAP can reverse the cardiovascular consequences of obstructive sleep apnea. It has been reported to decrease blood pressure in more severe OSA patients, but sadly, after following these patients for 3.7 years in a recent study, using CPAP for an average of 3.3 hours per night, the endpoint for heart attacks, strokes, heart failure, and angina did not move. However, it did improve daytime drowsiness and quality of life, less snoring, and mood. If patients used CPAP the entire night, these results might be different. The problem with CPAP is keeping it in place all night. Many patients remove it while asleep. Most studies report 2-4 hours of continuous use is about the norm, and therefore, half or more of the night, the patient is not protected. 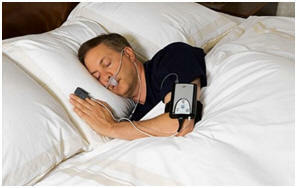 However, a recent study reported 68% of patients were using their CPAP regularly after 5 years. OSA does not go away. This is a life-long commitment. Giving up on treatment will only aggravate symptoms and continue to create serious health problems. If that happens, consideration for alternative methods including surgery is indicated. The need for management of existing medical issues including excessive weight aggressively is critical to prevent a complication. Surgical results depend on the technique used, experience of the surgeon, additional weight loss, and supplemental CPAP. In my hands, improvement with most of my patients reduced by at least half of their apneic episodes. Oxygenation was brought back to safer levels, and the patient always was relieved of daytime drowsiness, and improved their quality of life. However, some still had to use CPAP, but with lower pressure settings, which makes it more tolerable. Also continued weight loss was emphasized. Residual fatigue and daytime drowsiness may be treated with brain stimulants-- either modafinil (Provigil) or armodafinil (Nuvigil). Monitoring of the patient’s weight is very important, as weight gain can affect how much pressure is necessary to relieve OSA with CPAP. Unless, a person is cured of a significant number of apneic episodes by losing excessive weight, relieving anatomical abnormalities with surgery or dental prostheses, getting the blood oxygen levels above 90%, and wear CPAP all night, the reduction of cardiovascular disease may not occur. This subject is on the minds of most Americans. It is such a complex issue. We continually are caught between Big Pharma(PhRMA)— -- saying they need these prices high to cover their expenses for research and development and Americans wanting reasonably priced drugs. In fact, we are paying more because our government allows it. We are also paying for all their failures. Only 5 in 5000 drugs that enter preclinical testing progress to human testing, and only 1 in 5 of those are actually FDA approved. Pharmaceutical companies are sending big checks to politicians. The company, Mallinckrodt spent $44,000 in contributions in the first quarter of 2017 to congressmen. They also spent $610,000 on lobbying efforts for Congress (Democrats and Republicans). They are responsible for making one of the most popular pain medications (fueling the opioid crisis), and recently marketed their multiple sclerosis drug for $34,000 (Acthar) a vial ($162,317 per year) in 2015 according to Kaiser Health News. It was Medicare’s most expensive drug per patient in 2015, making up a third of the revenue of the company. It cost $40 a vial in 2001. It’s legal home is Ireland evading taxes in the U.S.
President Trump is asking for cooperation from Congress on this terrible issue, but even the Republicans do not uniformly support him. They are more interested in their own skin and their own pocketbook. Drain the swamp!! Sanofi and Pfizer pharmaceutical companies top the list of donors to Congress according to The Financial Times. At the same time, this company was even called out by the pharmaceutical industry for not spending enough on research. Mallinckrodt was fined by the Federal Trade Commission $100 million because of the drug Acthar having illegally quashed competition for MS (multiple sclerosis) drugs. When congressmen are seeking re-election, they get very aggressive in soliciting money from any source. Ask your congressman how much money he gets from Big Pharma! In 2015, CMS (Centers for Medicare and Medicaid Services) reported that prescription costs account for 10% of the healthcare dollar increasing 9% more to $324.6 billion. The new extremely expensive cancer drugs account for more than 50% of the cost of all drugs on the market. These outrageously expensive drugs are going to increase 20% per year for the next few years, according to the cancer organization (ASCO—American Society of Clinical Oncology). Compare the price of prescription medications (9%) to the total of cost of Medicare (20%) and Medicaid (17%) to the total healthcare dollar, while total healthcare costs are currently 17.8% of GDP. The total cost for healthcare was $3.2 trillion in 2015 and is expected to cost $3.35 trillion this year. Slightly less than 10% of people in this country are uninsured. The cost for healthcare coverage in 2015 was just under $10,000 per year per person. If 2017 figures were available, it would be well over the $10,000 figure. The costs are projected to rise 5.8% per year from 2015-2025. Big Pharma-phRMA(Pharmaceutical Research and Manufacturers of America) is the name commonly used to identify the pharmaceutical industry. The 11 largest global drug companies made $711 billion over 10 years ending in 2012 according to Healthcare for America Now. Thanks to our government not negotiating Medicare prices, our cost is about 40% higher than Canada and 75% greater than Japan. The feds negotiate prices (about 20% discount) for Medicaid but not Medicare. You can point your finger directly to the lobbyists and congressmen who are getting contributions for their campaigns. (Drain the Swamp). Our doctors prescribe more than most country’s doctors, while patients have learned over time to be extremely dependent on a pill to cure everything. There is plenty of blame to go around. New York State Legislature is working on a system to curb Medicare prescription costs (we will see how successful they are). In 2014, the total revenue for the pharmaceutical industry exceeded $1 trillion dollars for the first time. Pfizer is #1 and had a total revenue of $53 billion. Pfizer makes Viagra, Viracept for HIV, Xalatan for glaucoma, Xanax for anxiety, and Lyrica for pain, seizures, peripheral neuropathy, restless legs, etc. to name a few of the big hitters. Consumers have learned to request generic drugs, we are now facing insurance companies that won’t pay for generics, rather they only pay for the brand name drug which requires a much higher co-pay. This does not make sense unless you realize that once again big corporations are teaming up to keep the price of drugs high and fatten their pockets. The pharmacy distribution and benefit managers may be in the middle of this as they control distribution of drugs to pharmacies. Insurance companies are either getting paid under the table or there is some multilayered cover up. This was front page news in the New York Times on August 6, 2017. Be sure your doctor is prescribing generics. CVS Caremark (CVS Silver Script is one of CVS’ insurance companies), one of the largest benefit managers sent a memo to pharmacies informing them that some of the Medicare prescription drug plans would cover only brand name drugs. I have no answer. There is such aneed to reform healthcare (even Medicare). President Trump supports healthcare reform but nothing has happened, thanks to disarray in the Republican Party. There are those that want everything to go their wy or they will not vote for reform. Without fixing our problems, the costs will continue to escalate, and we will eventually be forced into single payer healthcare. Can our economy withstand single payer? By the way, now that most doctors are employees, many are ok with single payer (including academic centers and organized medicine). They are on salary so any plan that pays for every bill, why would they not be ok worth it? Call your Congressman about negotiating Medicare prescription prices with Big Pharma. There is nothing we can do about doctors being run out of private practice (because of regulations and enormous administrative costs). Mergers of practices are happening everyday. Centers like NorthEast Georgia Center in Gainesville, Georgia controls the northeast part of the state now, and Angel Hospitals form Asheville control Western North Carolina. There is no competition. You know what that means. These centers can charge what they want for medications. After a patent is lost for exclusive distribution of a drug, a brand drug can be produced and distributed as a generic duplicate. It is no longer being produced by the brand name company. There are pharmaceutical companies that do that. Why then are there continued high costs for these off-patent drugs up to a year after the drug can be produced as a generic? The answer---there is a delay in getting those generics? The brand name companies pay the generic companies to delay production of a generic or the generic companies are paid to produce lower numbers of these drugs for a year and longer!! A significant number of these generic companies are not based in the U.S. and out of the direct jurisdiction by the FDA. My wife takes a weekly shot for a disease and that drug (Avonex) that has been around for 20 years is still costing us $1000 a month (insurance pays $4000). There is no generic equivalent. Our government paid $173 million a French company (Sanofi) to develop the vaccine for Zika virus development and production was funded by the U.S. Government, and gave them exclusive rights to distribute it. Our government gave them the right to charge whatever they choose and we paid for it. Does that make sense? And some people want more government control and even have governmental control all of healthcare. President Trump has got to ban lobbyists lining the pockets of our congressmen, but how do we get the US Congress to do this when their pockets are being lined by Big Pharma? Congress also must vote to negotiate prices for Medicare like they do Medicaid. The whole system must be reformed including the FDA. We the people must insist!! Actually the big money for Big Pharma today is switching from brand name drugs to a class of drugs called specialty drugs (IV cancer drugs-immunotherapy-Opdivo, Yervoy, etc., arthritic drugs (Remicade, Humira, etc). The cost rises as most physicians are now employed so hospitals and clinics will be buying these specialty drugs directly and billing insurance higher prices (estimated to be 20% higher than when physicians bought these drugs). The medication to treat hepatitis C (Sovaldi) is $1000 a pill (regimen is a pill a day for 12-24 weeks=$168,000 for the potential cure (96% cure rate) and 2.7 million Americans have been diagnosed with Hep C.
The main U.S. trade group for generic pharmaceutical companies filed a lawsuit recently against the State of Maryland blocking the state attorney from keeping generic drug prices low on Medicaid patients that included a $10,000 fine for price gouging. This is what we are up against. Even the generic companies are using our constitution to prevent the American people from getting reasonably priced medications. The courts will rule this month. A recent article from the NEJM (July, 2017) stated that over 50 of the most popular older generic drugs have increased in price by 400% between 2012-2015. Antibiotics are some of the most common drugs in short supply. Epinephrine, atropine, cortisone, albuterol inhalers, lidocaine, nitrous oxide, and many other injectable medications primarily used in the hospital are often backordered due to shortages. The FDA is working to resolve these shortages and are having some success. If these smaller companies are being paid big bucks to delay distribution, that must be stopped. Fines have been levied against some companies. There is always a middle man in business. The pharmaceutical companies must store and distribute these medications to over 200,000 U.S. pharmacies. However, they do not do this….there are distribution centers to facilitate this. It also must supply hospitals, clinics, and long term care facilities in the U.S. There are major distribution centers around the country that perform this massive task and it is big business. There are three major companies that monopolize this industry—AmerisourceBergen, Cardinal Health, and McKesson Corp. The combined 2016 revenue for these three companies was $378.4 billion and this year is expected to surpass $400 billion. The consolidation of major national companies with mergers is pressuring wholesale prices to rise. Some of the major players are CVS, Walgreen’s, Walmart, Rite-Aid, and United Health Group. Walgreen’s actually owns ¼ of the number one distribution center (AmerisourceBergen). Mergers usually mean higher prices. Healthcare could be less expensive, but as long as our government is in bed with Big Pharma, we are up a creek. And who is regulating these distribution centers, and think what will happen if the government runs all of our healthcare with all the outside influences buying the loyalties of our Congress. A recent poll stated that 8% of Americans are getting their prescriptions from Canada or other countries. Although illegal, our government (FDA) has not enforced the law. There has been legislation to authorize broader importation from Canada, but has never gained traction at the federal or state level (can you say lobbyists?). In fact, the 2003 Medicare Modernization Act enacted Part D, and included a provision to allow importation of drugs from Canada if they are safe and could save money. Senator Bernie Sanders proposed legislation for implementing this provision but was voted down by other U.S. Senators, because of concern about safety from the FDA (by law they must be equivalent. Tell me Big Pharma is not behind keeping Canadian drugs out of our country! The Canadian government has even offered to pay a user fee to provide extra safety measures for drugs coming to the U.S. and yet they are not officially legal to be sold here. Drain the Swamp!! In the two previous reports, I have discussed the blood system and diseases of the red blood cells. 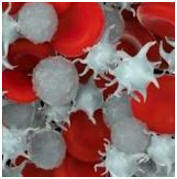 This report will discuss white blood cells and platelets, the other components of the solid portion of blood. The other component of blood is the liquid portion, plasma, and to complete the series, blood transfusions (red cell and plasma) will be discussed in January after leukemia and lymphoma is discussed. Most people make 1 billion white blood cells daily. The white blood count is an indication of how well the body responds to infections. With any acute infection, the white blood cells elevate to respond. The type of white cell elevation may hint at the cause of the infection (bacterial, viral, fungal, parasitic, etc.) The white cells travel to any infection site to fight the infection and try to keep it from spreading. a) Infection--A count higher than 11,000 is considered high. If a patient has an infection (especially bacterial), it is expected that the body increases the white cell count. If it does not, this may indicate more serious underlying diseases and a poor response to an infection. b) Drug and acute allergic reaction—medications may increase the white count in response to the challenge of an allergic reaction, especially if it is a sudden reaction, such as a penicillin reaction. Also acute allergic reactions from food, pollens, mold, etc. may create an elevated white count with specific types of white cells. c) Diseases of the bone marrow—diseases of the marrow may be the cause for a elevated white count. 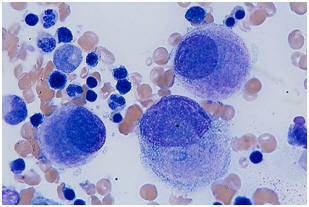 When this occurs, there is a concern for leukemia. d) Immune system disorder—an elevated white count may occur with an underlying immune disorder. Rheumatoid arthritis may elevate the white count with an increase in lymphocytes. (explained later), polycythemia vera, smoking, acute injury, and stress. Neutrophils elevate in infections caused by bacteria and viruses. Lymphocytes elevate to increase an immune response with antibodies to fight infections and immune diseases. Basophils secrete certain chemical that alert the body to the presence of an infection and elevate in allergic reactions. Eosinophils elevate in a reaction from parasitic infections, cancer, and allergic reactions. Monocytes breakdown the walls of bacteria in fighting the infection. When the white cell count drops below 4,000, this may be a cause for concern, as it may indicate a poor immune response to an infection or reaction. Certain diseases should be ruled out such as HIV-AIDS, certain viral infections, and an underlying illness such as lupus, Sjogren’s disease, Lyme disease, etc. The most common white cell to be decreased is the neutrophil, hence the word neutropenia (penia means less). However, any type of white cell may be decreased due to certain circumstances. For instance, if there are decreased lymphocytes (lymphopenia), viral infections and immunosuppressed patients may be the cause. Just as in red cell diseases, leukopenia can be caused by a drop in production of white cells by the bone marrow or actual destruction of the white cells. There are multiple causes. Chemotherapy, immune medications for diseases such as multiple sclerosis, radiation, myelofibrosis, aplastic anemia, leukemia, and viral infections all can cause a low white count. Cancer treatments that cause leukopenia may require a drug to stimulate the white cell or the red cell production. If the white count remains low, the patients are at serious risk for an overwhelming infection which can be lethal. Chemotherapy, for instance, may have to be stopped temporarily because of it. c) Medications—Certain psychiatric drugs, such as Wellbutrin, clozapine, and Depacote, may cause leukopenia; immunosuppressive drugs and arsenic poisoning, penicillin, minocycline, and steroids can cause leukopenia. There are medications that can stimulate bone marrow production of white cells (granulocyte colony stimulating factor), and chemotherapy in particular can interfere with this protein. Neupogen, Neulasta, Leukine, and Prokine are medications to act like (called agonists) the granulocyte colony stimulating factor to stimulate the bone marrow to accelerate the production of white cells. These medications may be given 24 hours before chemotherapy to help prevent the side effect of leukopenia. These medications are extremely expensive and do have some significant side effects including spleen rupture (from stimulating the spleen to make white cells), serious lung disorder (ARDS), and allergic reaction. Platelets are not actually complete cells. They are cell fragments primarily composed of proteins. Like other blood components, their numbers are controlled by a protein manufactured by the liver called thrombopoietin, which stimulates a bone marrow cell called megakerocytes. This cell extrudes platelets from the cytoplasm, which circulate in the system to be called up by the body to assist in clotting when bleeding occurs. There is a protein in the platelets that attracts other platelets to form aggregates for participating in the formation of a clot. In the left slide below, one can see platelets (little dots) inside the megakerocyte, which are expelled out of that cell. 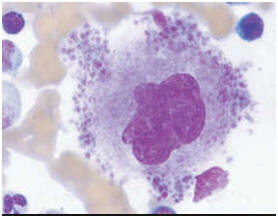 On the right is an abnormal megakerocyte(leukemia). Both slides are from a bone marrow biopsy. As many as a third of the blood’s platelets reside in the spleen ready to mobilize when called. Platelets have a life span of 7-10 days. The normal platelet count is 140,000-400,000. Too few or too many create trouble. Platelet disorders create problems with hemostasis. This term is the body’s mechanism of keeping a balance between clotting and bleeding. Previously, I described a term called myeloproliferative neoplasms. These are malignant causes of increases in blood cells (polycythemia vera, myelodysplasia, and thrombocythemia). When these cells are produced abnormally by the bone marrow, these diseases occur. Thrombocythemia is rare and causes problems with abnormal clotting and strokes. These patients can progress to polycythemia vera, myelofibrosis (scarring of the bone marrow), or leukemia. Interferon, Anagrelide, or hydroxyurea are used depending on the patient. Aspirin is also used to prevent clots. Keep in mind anticoagulants do not affect platelets (they interfere with clotting factors). This disease is an autoimmune disorder caused by antibodies against their own platelets. The cause is unknown (hence the word idiopathic), although occasionally occurs in patients with lupus and HIV. It is also a complication of hepatitis C.
b) Acute ITP, an autoimmune disease, occurs in children, while the chronic form occurs mainly in adults. The acute form usually occurs after a viral infection (even infectious mononucleosis) and is self-limited, and it presents with bleeding in the skin, mouth, and retinal (eyes) hemorrhages. The lymph nodes and spleen enlarge. The chronic form usually occurs in 20-40 year olds. It occurs more frequently in females, can occur during pregnancy, and after a transfusion. The above photo is a classic appearance of a patient who bleeds into the skin from low platelets (called purpura). Medications can cause decreased platelets to include some antihypertensives (thiazide diuretics), antibiotics, ibuprofen, heparin, quinine, non-steroidal anti-inflammatory drugs(NSAIDs), most chemotherapeutic agents, and even alcohol. Heparin-induced thrombocytopenia (the most common drug that can induce thrombocytopenia)—it can occur in 5-8% of cases of those who are given heparin. Heparin is a commonly administered anticoagulant after major surgery especially cardiovascular and orthopedic surgery. There are two types of reaction--immune mediated and non-immune. The immune mediated type causes a drop in platelets with potential for bleeding and the other non-immune type causes a direct reaction between platelets and heparin causing clumping of platelets and thrombosis (clotting).One of my former neurosurgery partners (in my multispecialty group) developed this after being given heparin after heart surgery, which suddenly created a clot in his lower leg and resulted in him losing his lower leg. Today, this crisis is treated with oral anticoagulants to prevent clots in the non-immune type without causing excessive bleeding. Drugs such as Xarelto do not react with the platelets in the way heparin does. 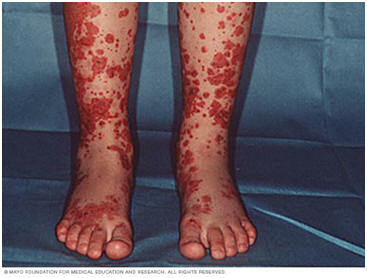 This rare disease is a very serious disorder characterized by fever, neurologic symptoms, kidney failure, and bleeding. This disease can also occur in autoimmune disorders, pregnancy, HIV, and caused by medications. Again, patients frequently report a flu-like syndrome 2-3 weeks prior to the onset of TTP. (There is a hemolytic uremic syndrome that mimics TTP). There are medications that can stimulate the bone marrow to produce more platelets. c) Medications-corticosteroids will boost the platelet count, and if that is not successful, there are medications to suppress the immune system, such as lithium carbonate or folate may recommended. Eltrombopag (Promacta) is used for autioimmune and hepatitis C cases. This drug mimics the effect of the protein substance that normally stimulates the bone marrow platelets (thrombopoeitin). Others include Nplate and Neumega. These drugs are also used in aplastic anemia, since this disease has low red and white cells, and platelets. There should be a response(rising platelet count) in 1-2 weeks. d) Surgery- splenectomy--removing the spleen may be successful since as much as one third of the platelets are present in the spleen. If the spleen is enlarged, this may need to be performed, and it is possible the spleen may be chewing up the platelets as part of the pathology of the disease, rapidly making more creating an enlarged spleen. I have not discussed the spleen but will do so when talking about leukemia. e) Plasma exchange—plasmapheresis is used to remove the plasma part of blood out and replace it with a substitute plasma richer in platelets. There are relatively rare disorders of the platelets which can be hard to diagnose until a person has surgery and the clotting mechanism is called to do its job and doesn’t. That is why clotting studies and a platelet count are performed prior to certain surgeries (in ENT and other procedures, it is commonplace). Von Willebrand’s disease is a common inherited bleeding disorder found in 1 out of a 1000 people. These patients usually have not had bleeding and bruising issues like in hemophilia. I have diagnosed this in a couple of patients with nosebleeds. The platelets have an abnormal protein that does not allow normal stickiness of platelets and therefore aren’t as efficient in forming clots. This disorder is similar to hemophilia and actually makes factor VIII (the clotting defect in hemophilia) less effective in the clotting mechanism. This is an important minor bleeding disorder but becomes an issue with patients who have surgery, and can cause excessive menstrual periods. There are many other rare bleeding disorders but not of enough importance to enumerate. Aspirin and NSAIDs cause platelets to lose their stickiness by affecting the protein (thromboxane) responsible for platelets sticking to each other. This is one of the methods used to “thin” the blood and prevent clotting of stents, heart valves, etc. Long term use of these over the counter meds can often be used instead of oral anticoagulants. I take 325mg of aspirin a day for life to prevent clotting of a carotid artery stent placed for radiation induced stenosis. 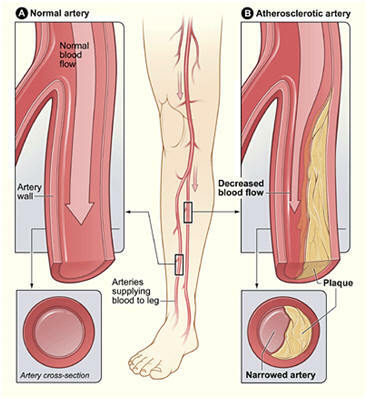 Peripheral arterial disease (PAD) of the extremities affects 8 million Americans over the age of 40. Risk factors for PAD are essentially the same as for any cardiovascular disease to include smoking, diabetes, lipid elevation, hypertension, family history, male, black, over weight, and aging. Smoking and diabetes provide a 3-4 fold increased risk. Symptoms include claudication (pain in the calf on exertion(see below), being relieved by rest similar to angina of the heart. Hair loss below the knee is common, and with more advanced disease delayed healing below the knee. In diabetics, foot ulcers can occur. Physical exam—If there is good blood flow into the foot a small artery (dorsalis pedis) can be felt beating on front of the foot and behind the inner ankle bone (posterior tibial artery). 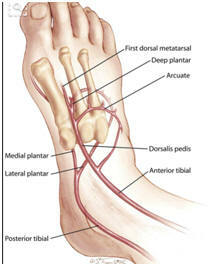 The drawing shows the dorsalis pedis artery (arrow). 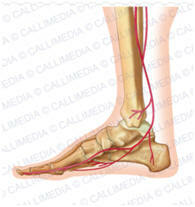 Also, there is an artery just behind the medial malleolus (inside ankle bone) called the posterior tibial artery. 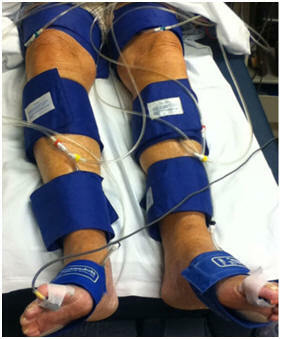 If those pulses are poor or absent, there are more tests that can define PAD. 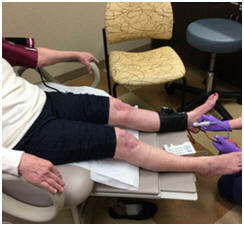 Ankle-brachial index test(above left)—a blood pressure cuff is attached at the calf and arm (brachial artery) and with the aid of an ultrasound machine, the cuff pressure is raised on both. The pressure necessary to occlude the blood flow in the thigh and calf is measured and should be about the same as the arm. If the calf vessel occludes sooner by greater than 15%, there is PAD present. This test is a simple screening test, measuring the changes in blood volume at various locations along the leg with the cuff pumped up to 40-60 mm Hgb. 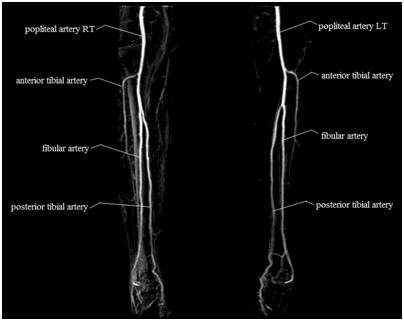 Arteriography will delineate the actual location of partial or complete occlusion. The arteries come off the aorta to the femoral arteries in the thigh and then to the popliteal and anterior tibial arteries splitting further as shown. Without blood supply to the lower legs, gangrene can from death of tissue causing serious sickness. This is an example above, and is a significant risk for diabetics and smokers with vascular disease. 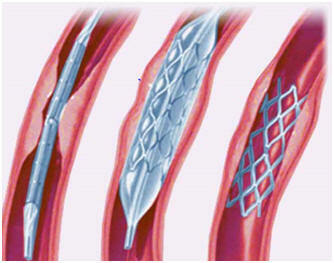 Often a diagnostic procedure (arteriography) can be combined with an angioplasty. 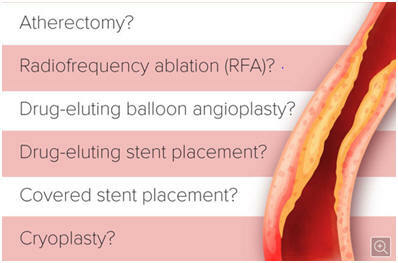 A balloon is inserted into the leg artery (femoral artery in the groin, and can dilate the constricted area and/or placement of a stent can be placed). On the next page, the first image demonstrates the technique of insertion of the vascular catheter, dilation with the balloon and insertion of a stent. The arteriogram on the next page demonstrates blockage on the left photo. The middle photo shows the balloon in place dilating the vessel. The panel on the right shows good blood flow through the femoral artery. The first-line treatment is medical: addressing the underlying diseases, stopping smoking, walking exercises, aspirin and or Plavix (anticoagulants). 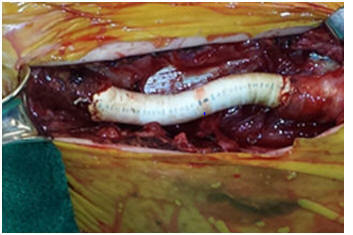 If those closed procedures do not work because of the length of arterial obstruction, a graft can be placed. 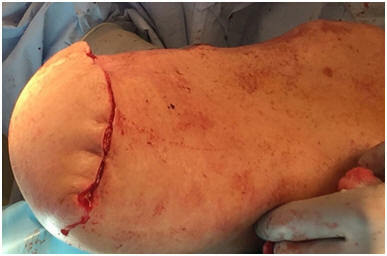 Amputation of the toes, foot, or lower leg may be necessary in extreme cases when gangrene has progressed or the patient’s dead tissue must be removed because of infectious complications. 2. As we age, can we stop certain routine preventative meds?